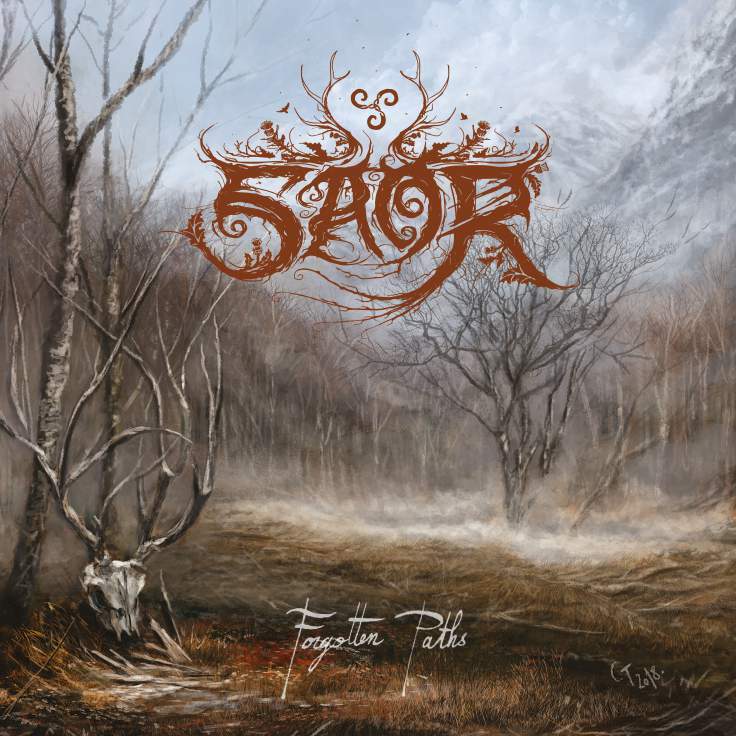 Among the hordes of black metal bands that have arisen from the UK in the past decade or so, like Ninkharsag or Winterfylleth, the Scottish one-man project Saor is the most sonically creative. Since his first full-length, Roots, back in 2013, Andy Marshall has been the sole proprietor of the Saor name, performing all instruments and vocals for all four albums – including this year’s Forgotten Paths. I was never in any doubt of what would emerge from this effort; lengthy, atmospheric black metal compositions replete with beautiful soaring folk melodies and stunning album art to match. I was not wrong. Andy seems incapable of writing low-quality music. Admittedly, I was initially disappointed at this album’s length. Forgotten Paths is at least 13 minutes shorter than his next shortest album, and it rides the fine line between anticipation and dissatisfaction. That’s my main gripe with the record. Sometimes it ends with me feeling mindblown and emotionally drained but, more often than not, I feel like I could do with one more colossal composition to whet my appetite. However, enough whining, because what’s actually on offer here is, unsurprisingly, of superb quality. Wasting no time with introductory ambience, the title-track flattens the listener right out of the starting gate with blastbeats and tremolo-picking abound. Saor always manage to make these typically aggressive traits sound strangely uplifting and optimistic, yet wistful and melancholic at the same time. Despite being able to make comparisons to fellow countrymen and genre-buddies like Cnoc An Tursa, this really is a sound all of Saor’s own. One can feel that deep devotion to the earth and its history. The folk instruments really come into their own here. The melodies on Guardians may have been more obviously pronounced but, on Forgotten Paths, they fuse with the clamorous black metal beneath and become integral to the compositional structure of each track. In fact, the whole of the latter half of “Monadh” is built around one simple folk melody, being built up and up to a grandiose conclusion. This kind of textural crescendo feels so much more natural and Marshall has nailed the art. The other tracks are constructed differently; the title-track being more of a tertiary piece containing a celestial, almost ethereal, middle-section with a superbly contrapuntal texture. At the eight-minute mark, you won’t believe that there are at least seven instruments/voices all playing different lines yet somehow all working together in sublime harmony. When this reaches its furious climax around the 9:30 point, it leaves me almost satisfyingly exhausted. Hold on to the moments like these, they are what give this album 100% replay value. There is a nice variation of tempos and rhythms throughout the record. Full-on blastbeats contrast with more off-kilter grooves and tranquil folk sections, akin to an epic quest. The mixing job is decent. I wish the drums could be a tiny bit further back, but Marshall’s growls are wonderfully distant, lead guitars wail with anguish, and flutes & fiddles leap out of the quagmire with blasts of beauty. Special praise goes to the five-minute instrumental finale, “Exile”. Surely one of the most heavenly and serenely gorgeous pieces of music in this genre. Fans of Saor won’t be at all surprised at how this sounds, but Forgotten Paths feels like the Scotsman’s next logical step – I only hope the albums aren’t getting shorter! Sure, it could probably do with one more big track, but a more beautiful black metal album you won’t find this year. This entry was posted in Bands, Black Metal, Folk Metal, Reviews and tagged 2019, 9/10, Aura, Avantgarde Records, black metal, British black metal, CD, Cnoc an Tursa, folk, folk metal, Forgotten Paths, Guardians, LP, Ninkharsag, Pagan Black Metal, Roots, Saor, scotland, Scottish black metal, UK, UK black metal, Winterfylleth.